A new Lord Longford and a new John Pilger? To be frank, I think neither of the bloggers I'm referring will appreciate the comparison, but do better if you can. The earl of Longford, you may recall, championed the cause of Myra Hindley. He was also passionately opposed to inverts, a trait that will not endear his memory to Iain Dale in any way, yet Iain is showing the same increasing tendency to champion worthless causes. First his defence of thief and fraudster Derek Conway, then of Mad Nadine and finally of the crooked Phil Woolas. Yesterday he thought the thief Chaytor should have received a sentence painting railings rather than imprisonment. Ian might ponder that after a while, being defended by Frank Longford was to the British public a sure signal of someone's guilt. The new John Pilger, in the sense of fearlessly exposing injustice, may be Anna Racoon, once part of the Old Holborn team but now ranked number 2 in the Wikio ratings, two places above Iain and three above Guido. Blog bar thingys have been duly updated. The eighteen month sentence imposed on convicted Fraudster David Chaytor is just about right. As he wakes this morning (if he got any sleep at all) in the suicide-watch cell he is undoubtedly being kept in for the time being, he will be undergoing an experience familiar to Jeffrey Archer and Jonathan Aitken, the lesson that nemesis always follows hubris. As I breakfast this morning on bread fresh-baked in my own oven, Normandy butter, rich coffee, real cheese and charcuterie, with the cats stretched out in feline bliss, and in the knowledge that I can do whatever I want today and go wherever I want to go, it's a compelling reminder that although honesty may not always appear as rewarding as the alternative, it's worth a lakh of rubies in reality. Jail tariff for Commons fraud? Back in October of last year I reported the Commons fees office employee who had been sentenced to nine months in prison for defrauding the House of £6k. Chaytor will be sentenced later today after admitting defrauding the House of £13k. His position was a lot more responsible than that of a fees clerk. We await with interest the jail tariff that will be imposed. Not only have we to endure paying 15% more for an increasingly overcrowded rail service, we face the risk that a cabal of exploding Jihadists awaits us at London's mainline stations. And now there's a variation on the risk from fat Pakistanis and Somalis (a fat upper body indicating a suicide vest) - that of lumpy Pakistanis and Somalis. You see, trying to carry an AK47 on a crowded commuter train will earn the Jihadist the same crushing refusal as shown to the nerk who tries to board such a train with a folding bike. So the Mumbai Method must be modified for National Rail, and will no doubt include pistols and fragmentation grenades, making the Jihadists lumpy rather than fat. 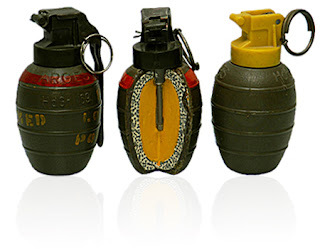 These grenades from the Pakistan Ordnance Factories each has about 3oz of PETN wrapped by around 5,000 ball bearings, enough to truly bugger the iPad. Oh well, such is the lot of the British commuter. How much of your net income do you spend on food? Exclude from your weekly Tesco bill the booze, the detergents and the DVDs. I reckon mine's about 7%, maybe 8% - and this includes real bacon from Borough Market, unpasteurized cheese and coffee from a French importer, artisan bread and the rest, offset by cooking generally undervalued ingredients, such as the cheap beef shoulder and root vegetables now meltingly part of a glorious winter Pot Au Feu and good for at least three days' dinners. The only supermarket item that's raised an eyebrow recently is the cost of Basmati rice, a tad over £1.50/kg, with a bulk commodity price of £600/tonne or so, within reasonable mark-up terms. Anyway, being honest, a 20% rise in food prices would still only take my food spend from 7% to just 8.4% ... it's the gearing. High national per capita GNP and smaller populations make nations resilient to food price shocks, whilst low per capita GNP and large populations make them extremely vulnerable. Following the 2008 commodity increases, far more people in poorer nations are now paying 60% - 80% of their net incomes on food, making them extremely vulnerable indeed to future price shocks. There's a third factor, of course, and that's the land resource each nation has in relation to population - lots of land and low population can indicate a degree of self-sufficiency - Australia and the US are good examples. Conversely, the UK, which has been unable to produce domestically sufficient food since around 1900 and now imports some 50% of all food, remains vulnerable on this score if protectionist measures are taken elsewhere - such as India's prohibition on rice exports. Or if a nation like China with trillions in foreign reserves commits these resources on the market to offset a food price shock. 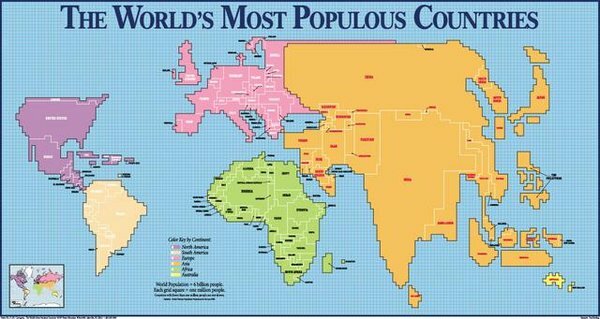 The Africans, as always, are buggered. Something incredibly important happened last year. Without ever formally being asked, the British public decided almost universally that MPs should no longer be regarded as privileged. We made it clear that we want to hold the financial rewards of MPs at about the level of commercial middle managers, without additional perks or special treatment over and above standard commercial practice. Nicholas Winterton's defence on R5 of first class rail travel at the taxpayer's expense, Eric Pickles' savaging on Question Time over his inability to understand that MPs aren't a special case (What, like a job, Mr Pickles?) and the stunned audience reaction to Margaret Beckett's similar claims on the radio version are still just the tip of the iceberg; most MPs still don't get it, and won't accept it. Cameron has already signalled to the House that he thinks MPs can now get away with reversing some of the reforms, and in particular getting rid of the bothersome IPSA, and that he will quietly nod such changes through. No doubt he imagines that at this stage in the Parliamentary term he can get away with it, that we will have forgotten our outrage of 2010 by 2015. In this he is grievously mistaken. The reaction of Sir Ian Kennedy, the IPSA's chair, has rightly been to affirm that he wants to hear our views - the views of the British public - before any changes are made. He said so in a press release on 16th December, and has reaffirmed this yesterday to the BBC. Cameron is probably doing everything he can to engineer legislative changes before the public can be consulted - he may even block Sir Ian's consultation. I urge you therefore to support Sir Ian in ensuring the we, the British public, are given our say. Not only will my travelcard cost more this morning, but the VAT increase will add its own premium. This is the price we must all get used to paying to pay down Labour's deficit - a mismanagement of the economy so egregious, so incompetent, so criminally negligent that I still want to see Brown, Balls et al in the dock for it. Gordon Brown, as I pay for your monumental blundering today, I spit on your shadow. Cameron's 'nudge' advisor, Chicago academic Richard Thaler, is probably completely unfamiliar with the Liquor Control Orders introduced by the Defence of the Realm Act (DORA) of almost a century ago, yet has managed to arrive at exactly the same solution to binge drinking as did Lloyd George's government - the banning of buying rounds of drinks. No person shall either by himself or by any servant or agent sell or supply any intoxicating liquor to any person in any licensed premises or in any club for consumption on the premises unless the same is ordered or paid for by the person so supplied; nor shall any person order or pay for or lend or advance any money to pay for any intoxicating liquor wherewith any other person has been or is to be supplied for consumption on the premises; nor shall any person consume in any licensed premises or club any intoxicating liquor which any other person has ordered or paid for or lent or advanced money to pay for. Did it work? Yes, in a way. It helped to prevent lighter drinkers in a group from being trapped in a 'race' with beer gluttons, and it's always the gluttonous drinker in a group who benefits from rounds. However it didn't help at all the person whom Cameron would like to target - the gluttonous drinker. It stayed on the books until the 1960s - or at least the 'No Treating' notices survived until then. Widely breached by men entertaining women, whether their wives or not, it fell into desuetude and like the law about bicycle bells was forgotten even by policemen. The idiot Lansley, who in November announced the introduction of swipe cards that kids could swipe on lamp posts and pillar boxes whilst out jogging to earn free training shoes, provides further evidence today that he's completely lost it. If there's a prime candidate for a Cameron reshuffle it's this mumping fool. What's he done now? He's put the weight of government endorsement behind a number of multinational corporates in their efforts to secure brand loyalty amongst young children. Whilst his colleagues are getting the message out about buying local, using local produce, rejecting advertising and glitzy packaging and supporting a diversity of small-scale production, Lansley has thrown the Health Department behind a £250m marketing campaign by Unilever, Nestle, Kelloggs and Birds Eye to secure brand awareness amongst the under 10s with the perverse message that factory-made gloop carried in chemical vats half way round the world before manufacture is better than the stuff in the village shop. At first sight I was a little puzzled by the news in the Telegraph that the government had given the OK to deep-water oil drilling; "drilling could take place at hundreds of sites off the British coast after MPs ruled out a moratorium" bleated the Cleggograph, in certain ignorance of the topography of the seabed. And as a result no doubt retired insurance agents in Frinton-on-Sea, alerted by the paper, will be waking up to the new threat on their doorsteps. As far as I knew, there was hardly any deep water at all within the UK's 200 mile Economic Zone. A quick look at Google Earth (perhaps someone could pass on the URL to Louise Gray and her subs at the Cleggograph) confirmed the extent of the continental shelf and of shallow seas - just a few areas off the NW of Scotland, and the trench between the Shetlands and the Faroes, were deep water. Then I remembered Rockall. It's ours, of course, but the pesky Irish, Faroese and even the skint Icelanders have all registered a claim with the UN. It's within 200 miles of Scotland and comes under Harris Council, who recently granted planning consent for a replacement plaque on the rock proclaiming the UK's ownership. 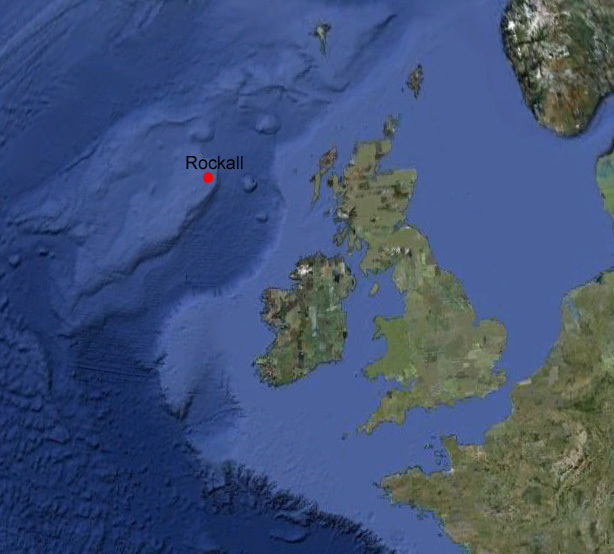 Now the problem is, for us to claim a 200m zone around Rockall, it needs to be permanently inhabited, and this is an excellent challenge for Cameron. I'm sure the west-country chap with the oversized buggers' grips who made the Mars lander could turn his hand to a pod that would bolt onto the rock and provide a habitation for a permanent scientific team - why not? Any comment Mr Balls? Mzz Cooper? Mzz Harman?